Year 5/6 girls, boys, mixed and Year 7/8 boys and girls teams had 30mins to find as many checkpoints as they could using only orienteering maps and a watch. Checkpoints were placed in various locations throughout some of the lower tracks around the forest. For every minute late back teams had 5pts deducted from their final score. 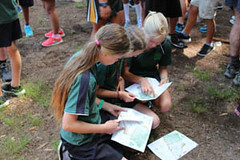 A number of the children had never done orienteering before so it was great to see them giving it a go. A big thankyou to Orienteering BOP who ran the event on the day.